Ugh, I have SO neglected this blog! And because of it, I have so much to catch up on posting. I could cite the usual busy-busy excuse…but who isn’t busy these days? So, I guess I have to come clean with all of you and say it like it is. I COULD blame Tribal Wars, Farm Town and Bejeweled Blitz, in all their time-suckage glory as the reason why I haven’t posted. But to be honest, I’ve been lazy as hell. There, I said it. And see? Here you all thought “La” stood for Laura Ann, didn’t you? Nope. LazyAss is more like it. For those of you who lost track of what’s been going on here, on August 8, 2009, Dizzy Blonde Studios celebrated its 1st anniversary! To celebrate, I put all the yarn on sale, gave away vouchers for free patterns along with any yarn purchase. Also, I held a drawing for a prize package of undisclosed goodies. Now, you can ask anyone who’s been the recipient of one in the past, LazyAss gives good prize. I’ve got 2 projects on the needles, both original designs. At about 75% knitted, the first project is a pair of toe-up socks which, for lack of a better name, will be called Tenderfoot. The concept is rather unique…well, it was when I started. That was before the latest Knitty hit the monitors. (Speaking of which, just how cute is that crab???) Oh well. Even if the concept is now yesterday’s news, the engineering of it is still rather unique, and I look forward sharing my genius (yeah right) with the world. The second project is another one I started ages ago that got bumped in favor of Oooooh, shiny! It’s a cabled panta/head band that I hope will have matching mitts before I’m through with it. And even though the cabling concept of this IS unique to me, the engineering is so not. I also have ideas in the works for a beaded lace scarf, a lace cowl, a lace shawl (see a theme here?) and finally getting around to designing my Hoban Washburne-inspired mansweater. Also, somewhere in there, I want to do a child’s dress and another Firefly-inspired baby blanket. Yup, that’s not a typo. I have an FO. In fact, I have 2.…well, 2 that I can share at least. First, yet another pair of Roman Udones. Wow! How unusual! And I’ll KEEP making them as long as there are Romans with cold feet! Mods/Notes: It’s very hard to tell by the photo, but I added beading to the shawl…in each “eye” of the oriole and in the edging. The pattern was wonderful to knit. The finally product looks a lot more difficult to make than it was. The instructions and charts were very easy to follow. 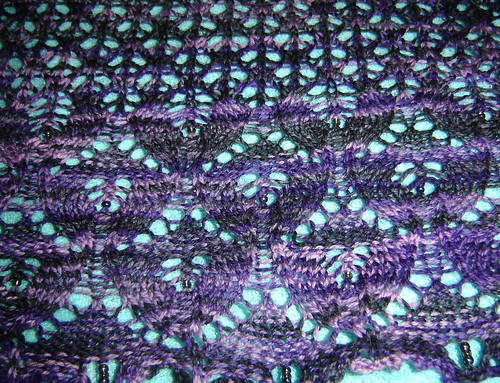 And I LOVE how Marnie “gets it” when it comes to lace shawls. Her treatment and application of lace is delicate and airy-looking, but still substantial enough to be more than “window dressing”. Not heavy -handed at all, unlike a few of the shawl trends I have seen lately. I will definitely knit this one again…and maybe again. I must be one hell of a tight knitter, because my shawl fell short of the recommended dimensions. But I see that other Ravelers, while using the yarn the pattern was written for (pssst….Dizzy Blonde Studios) got the larger shawl Marnie intended, so I know the fault lies with me. I think the next one I do, I’ll go up a needle size or 2, and even add an additional repeat of the small leaf pattern. I definitely like the effect I got with the beads, and I’ll use them again. This Saturday, August 29, 2009, I’ll be attending Griffin Dyeworks Fiber Frolic with spinning wheel, lazy kate, drop spindle, and knitting in tow. Any Southern California fiber enthusiasts are welcome to join me! I’d love to see this local event grow into something big and permanent. There seems to be a lack of knitting classes, so I’m hoping to set up shop and/or teach at the next one. Be afraid…be VERRRRRY afraid! Gorgeous,La. So it really wasn’t hard? It looks it. Ya know, I think I have a nice big skank of dizzy blonde around here somewhere. Hah. 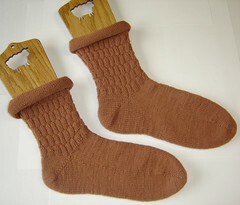 I need another project to not knit, just like I need another blog to not write. Isn’t it a wee bit aggravating when someone else beats you to publishing/showing off your great ideas? I’ve got a couple that I need to frog now (because they’re barely out of the cast on stage). Congratulations, Jen (I read that as PiddlePoop too). Oooh that shawl is simply GORGEOUS! 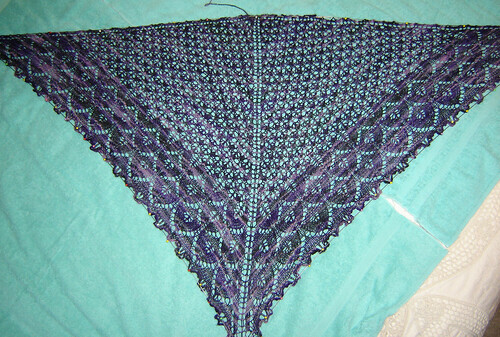 I love the shawl, though I wish the beads photographed better (always, always). You aren’t lazy! You have to beat your old score in Bejeweled! I know I have to. holy cannoli i freakin won something????!!!!!! HAPPY HAPPY JOY JOY HAPPY HAPPY JOY JOY JOOOOOOOY!